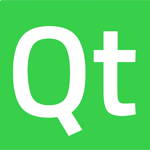 I received a bunch of questions about the Qt Paint App Example, so I decided to do a tutorial in which I explain every line of code. This paint app allows for opening, saving and printing images. You can also draw on the screen using different colors and pen widths. The are a bunch of dialogs covered as well along with numerous other topics. I provide all of the heavily commented code below for the finished app. If you like videos like this, consider donating $1, or simply turn off Ad Blocking software. Either allows me to continue making free tutorials for all.